Navigation data is poorly available in Antarctica. If navigational data is available it often dates back to the early 1900s with many lead line surveys. An initiative was undertaken by Stephen Wilkins of Xplore Expeditions to collect bathymetry with a multi-beam survey system making use of the sailing vessel Xplore. Together with Yoann Boulaire from SHOM, France and Fernando Landeta, hydrographic technician from Skyring Marine Chile, an IHO qualified survey was performed in Antarctica on an expedition sailing yacht. As all mariners navigating in Antarctica know , one must use a combination of all available means to enable safe travel in this region. The international collision regulations state that one should use all facilities. In this age of very accurate technology many mariners around the world are too easily swayed by the ease of electronic systems. In Antarctica sailors must use everything, including depth soundings, ranges and bearings by any means and radar, GPS and currently available electronic charts are more a last resort due to offsets in old survey datums and poor quality. Only 2% of the Antarctic coastline inside the 200 metre depth contour hasbeen surveyed . More has been done for the Antarctic Peninsula, but much of the available charting for this area dates back to the early and mid 1900s and are presented in fathoms and feet on black and white hand drawn charts. The soundings on many charts would have been done with lead line soundings; using a weighted line to check the water depth. Certainly not what we would call high tech nowadays, but to date it’s the best that there is in Antarctica. Antarctica is an international territory, meaning that it is not owned by any country, though many countries have an interest in it. These countries have come together in what is referred to as the Antarctic Treaty Commission (ATCM) and they are the stakeholders and caretakers of Antarctica. The ATCM and the International Hydrographic Office (IHO) decided to form a joint members commission with the task of collaborating hydrographic efforts between nations that have survey vessels and staff to continue the growing need to survey Antarctica. This new group has been called the Hydrographic Commission of Antarctica (HCA) and their mandate is to produce better navigation information and charts for the frozen south. The same questions and issues kept being raised at the HCA meetings and other hydrographic forums. However, we are now pleased to be able to say that there are some very pro-active people who are equally hamstrung and frustrated by the processes and speed at which these glaring issues would ideally need to be addressed. The reality is that for all vessels to travel in the safer south we need to move forward. The pure waters of Antarctica may be clear, but the tasks of surveying and allocating funds and resources are very ‘muddy’. Many navigation charts and electronic navigation charts that are currently available for Antarctica are quite inadequate for mariners; not all, but surprisingly many. Islands and land masses are frequently out of position, some by over one nautical mile in some locations and bathymetry and shore outlines have changed or are incorrect. There is so little useable navigation data for charts, and much of the available material is very old and inaccurate, that there are large areas of white paper areas in which there are no details. This is well known to those who regularly ply these southern waters, but being an international territory it is not clear under whose responsibility this falls. Mariners sailing in the region are therefore drawing so-called ‘Mud Maps’. Mud maps are small detailed charts of locations and anchorages that are often not even shown on the available charts. Hand drawn, using a zodiac with depth sounders, note books, a hand compass and a GPS, we soon learnt how to put together some very credible images that make it easier to navigate into these locations. The Mud book created over the last 10 years by the skipper of Xplore Expeditions, Stephen Wilkins, grew quite large. The fastest way to accurately survey any seafloor area was by using a multi-beam sonar. The challenges of using a multi-beam sonar for someone not having experience with such sophisticated equipment are numerous. Besides the large costs, the technical skills needed to run these systems can take years to learn and the additional equipment that is needed for a proper survey is extensive. Moreover, if you want the data collected by these systems to be really useful then one requires a hydrographer on board to plan, collect, analyse and certify the collected multi-beam data and make sure that the survey is being conducted properly. After lengthy negotiations of nearly a year with a prominent hydrographic equipment company the multi-beam equipment was almost made available. Unfortunately, it was believed that it would be impossible for a sailing vessel to perform a multi-beam project. Stephen Wilkins came across a young hydrographer, Fernando Landeta, from Sky Ring Marine in Chile. Within 7 weeks they mobilised and prepared Xplore for a IHO standard survey in Antarctica. For the endeavour of survey perfection a qualified hydrographic surveyor was needed on board. Our Chilean technology provider is qualified but not to IHO standards. After contacting many countries around the world (Australia, New Zealand, UK, Chile and France) SHOM, France finally confirmed that they would be able to release one of their hydrographers to join the mission. This was a major step forward as the data could now be officially qualified and it could be demonstrated that a leisure sailing vessel is capable of performing official surveys. 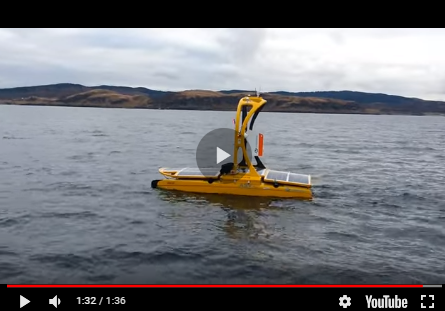 The multi-beam sensor, 512 beam dual frequency 200Khz and 400Khz with attached Sound Velocity Profiler (SVP) maximum depth capability 500 metres was installed on the bow of the Xplore. Taking the vessel’s motion into the consideration this was the most suitable location. The motion sensor was mounted directly above the transducer and the GNSS correction came via Fugro Marine Star. Three tide pressure sensors were used to gather tide data at each location. These sensors were cross referenced to the permanent tide gauge at the Ukrainian scientific base of Vernadsky and reduced from atmospheric pressure, this allowed the data to be corrected to chart datum. Meteorological data was also gathered by us each day and also cross referenced against the science station of Vernadsky. This was relevant to the total quality of data collected as the effects of temperature, atmospheric pressure and wind strength have a real bearing. During the 7 days of the survey, the Xplore and its team surveyed 15.2 square miles. Three different locations were surveyed, namely, Enterprise Island, Booth Island and Peltier Channel. All the collected data fell in the IHO category 1 and 2 standards. Furthermore, valuable passage sounding data was collected at all times on route to and from each location and at a safe water surround of the Cape Anna shoal where the cruise ship Ushuaia ran aground on. To confirm and substantiate the quality of data collection and the stability of the survey platform 3, separate calibrations were conducted, at the start, halfway and at the end of the surveying period including the critical horizontal and vertical offset checks. The instrumentation was interfaced to the PDS2000 software, which also recorded the collected data. Processing of all gathered data was then carried out using CARIS software. A major reason for doing this project using a multi-beam sonar mounted on a sailing boat was not only to be able to prove that it could be done, but also to show that a hydrographic survey could be performed to a standard that meets all of the requirements set down by the IHO. The future of this type of surveying is very much in the formative stage, and there were many lessons learnt. This experience has shown that yacht owners are not recommended to go out and purchase a multi-beam system to bolt on to their yachts, as there are many variables and additional parameters to take into account even before being able to make the data suitable for chart production. But in this modern world where technology is moving so fast, there are still remote and unexplored locations where adventure and new discoveries are possible, Dream the Dream, then do it. We would also like to thank John Clark, Australia, Alesia Ramanenka, Belaurus, Ugo Angelelli, Italy for their assistance and support and the crew of the Xplore, Debbi Smith, Scotland, and Meghann Jones Australia.